After years of our students asking me questions on everything from why people die to what I like about cats, this year nine students asked me this question about science and the Bible. Nine! What’s going on here? Why the sudden interest from our students about which “side” I’m on? More important, where did they get the idea that there are “sides” in the first place – that this question has a black-and-white answer? Maybe in today’s increasingly polarized atmosphere we should expect it. Television, news media and internet blogs share left-wing opinions that “religion is for ignorant fools” and right-wing claims that “science is a liberal conspiracy.” There is no room for compromise, for nuance. The question today is simple: Which side are you on? Do I believe in the Bible, or in science? I believe in both. I know that to some, this is a cop-out, a wishy-washy refusal to take a stand. But it is not a cop-out, and not wishy-washy: it is the essence of who I am as a Reform Jew. Dr. Kravitz would continue, “Zyklon B gas, used in the Nazi gas chambers to murder millions of people, is true. It exists. Scientists invented it to fulfill a function. It did what it was supposed to do. For nearly two hundred years, Reform Jews have tried to synthesize truth and goodness. We take a critical look at the Bible and Jewish law, and at times we decide that the practices they put forth are “entirely foreign to our present mental and spiritual state” (Pittsburgh Platform, 1885). But we also take a critical look at modern society, and much of our movement’s focus on Tikkun Olam – repairing the world – is a stand against the inhumanity of unregulated capitalism in which some people rise and others fall. And we take a stand against the “gossip industry” which thrives on the private lives and private troubles of others. As reformers, the verb that is part of our identity, we make the radical statements that not everything that is “religious” is good, and not everything that is “true” is good, either. Some of them say it is all right to share the information, since it’s true. Then I suggest they imagine the same situation, but this time they are the ones who are losing their home. Now is it okay for your best friend to share this news with everyone he knows? “Ohmygodno” is the unanimous response. “That which is hateful to you, do not do to another person,” I remind them. That’s how Rabbi Hillel summed up all of Judaism, and by extension, all religion. It’s important to know what is true, but it is just as important to think about what is good. We Reform Jews have the chutzpah to insist that our lives in temple and outside of temple not contradict each other. 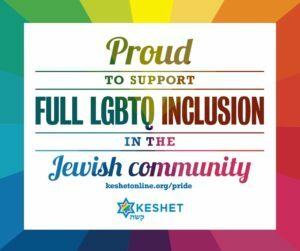 We fully embrace the technology which makes pushing an elevator button less work than climbing 14 flights of stairs on Shabbat, and at the very same time we fully embrace the idea that religion, not science, can guide us to live ethical, caring, passionate lives – lives which value goodness above all. So yes, I believe in science. And in the Bible. It might be simpler to believe in only one of them, but I can’t do that. I’m a Reform Jew. Shira joins me in wishing you an early Shana Tova – a year filled with good.